Here you can read my latest OpEdge piece for RT.com on the shocking new 'Body Count' report on the genocide unleashed in the so-called 'War on Terror'. Brexit 2020; What are the odds and what next for Europe? My new piece for Sputnik International. What are the chances of Britain leaving the EU following May's General election - and what would happen to the British economy if 'Brexit' did take place? Europhiles have long argued that if Britain did leave the EU it would be a disaster. Our trade with other EU members would decrease, and unemployment would rise steeply. Euro-sceptics on the other hand paint a picture of a thriving British economy once the country has been 'set free' from Brussels. My latest RT.com OpEdge piece. And what are the EU elite talking about? How best to counter‘Russia’s ongoing disinformation campaigns’. It’s good to know they’ve got their priorities right, isn‘t it? 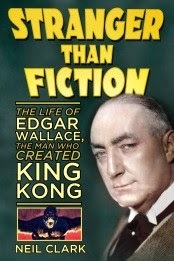 I talk about my new biography of Edgar Wallace, on the Kat Orman show on BBC Radio Oxford here. While here, (if you're in the UK), you can listen to a wonderful three-hour celebration of Edgar Wallace and his works on BBC Radio4Extra. There's an interview with me at around 1hr into the programme. Here is producer's Peter McHugh's blog about the programme. I hope you enjoy it. I still have a few signed copies of 'Stranger than Fiction' available via the paypal button on the top right of this blog if any readers would like one. Britain’s Budget Unveiled: but will it be enough to win the election? My analysis of the UK Budget- and its political implications- for Sputnik International. After a number of Budgets that benefited the well-off, the Chancellor used his last Budget before the general election to make life a little easier for those who haven't done well under the Tories - and whose votes they desperately need to hold on to power after 7 May. Forty years ago, Britain could be described as a vibrant democracy. Our parties lived up to their names: a conservative Party believed in conserving things, a Labour Party represented the interests of working people and a Liberal Party was liberal. We had a mixed economy, in which majority interests were put first, a sensible foreign policy - we pursued detente with the Soviet Union - and didn't seek to go around the world trying to stir up conflicts. The only foreign “wars” we got involved with in those days were the so-called “Cod Wars” with Iceland. Today, it's a very different story. Our political parties have converged around what author Tariq Ali has labelled “the extreme center.” The range of views which can be freely expressed in Britain without adverse personal consequences ensuing is narrowing by the day. Four great days of jump racing start today at the Cheltenham Festival. Where should you put your money? The latest ‘Cash for Access Scandal' to hit British politics makes the case for radical reform of the UK's current Parliamentary system an urgent priority. Two former Foreign Secretaries, the Tory grandee Sir Malcolm Rifkind Q.C. and Labour's Jack Straw, Foreign Secretary at the time of the Iraq war, (WMDs anyone?) were caught on camera boasting about their influence — and what they could do to help a fictitious Chinese company — for the right money, of course. Rifkind, despite receiving a £67,000 salary from British taxpayers, told the undercover reporters that 'nobody' paid him a salary and that he was 'self-employed'.